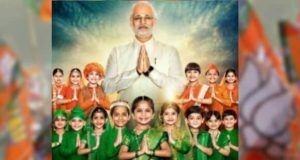 “Desh Bhakti hi meri Shakti hai (Patriotism is my power)” is the slogan of the biographical drama on Prime Minister Narendra Modi whose trailer is trending on YouTube. The trailer hit the Youtube on Wednesday and was successful in garnering over 9 million views in just one day. The film directed by Omung Kumar will … Continue reading ‘PM Narendra Modi’ to be Released a Week Before Lok Sabha Election 2019, Is it a Master Stroke in Favour of BJP?